Teams will be sent on a competitive mission to unlock as many challenges at vendor booths as they can using image recognition. Teams earn points as they activate and complete these tasks. Increase attendee engagement with exhibitors and encourage greater understanding of vendor offerings with our gamified experience. The perfect way to add a fun and exciting element to your exhibition. Welcome & Warm-Ups (5 minutes) Our staff welcome the participants and set expectations for the event. We then lead some fun warm-up activities that also randomly create small teams. Optional, depending on expo format. Conference Map: This interactive gateway to the challenges can show the layout of the expo floor, including the location of certain exhibitors. You can have multiple maps if it fits your needs. Virtual Reality: Participants can be instructed to scan certain signs, products, or materials or QR codes to see images or videos appear with additional information. A great way to introduce products and services! Vendor Trivia: Our scan-to-unlock feature can also re- veal questions about a vendor or the products and services they offer. Interactive Promos: Get attendees engaged and interacting with products by creating their own mock demonstration videos and “promotional” photos. Host Challenges: Ensure that attendees remember who is hosting your expo by using interactive questions and challenges about your organization. 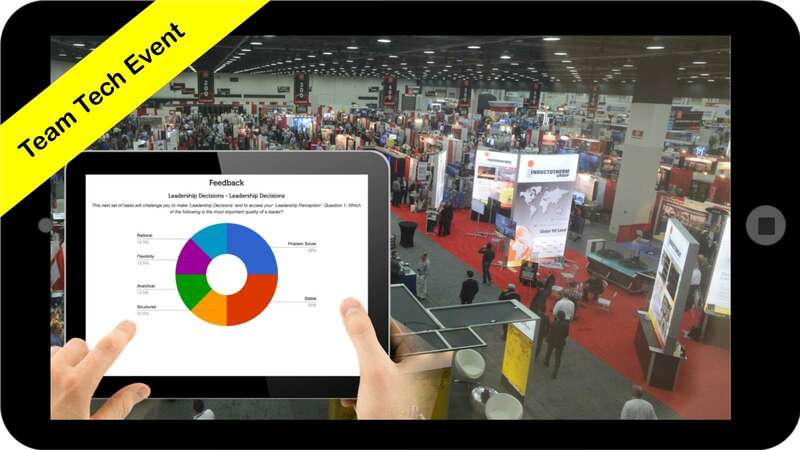 Attendee Feedback: Learn what is successful and not at your expo while it is fresh in attendees’ minds by collecting feedback with polls and questions. Wrap-Up (15 minutes) At the end of the expo, we present a slideshow of the best photos and videos. At this time, we can also announce high-scoring teams and distribute prizes to the winners. Create energy on the exhibition floor.